I am taking it for granted that the majority of our readers already understand WHY we need to get rid of the gun free zones. Today's article is focused on how I think we might go about the legal process. 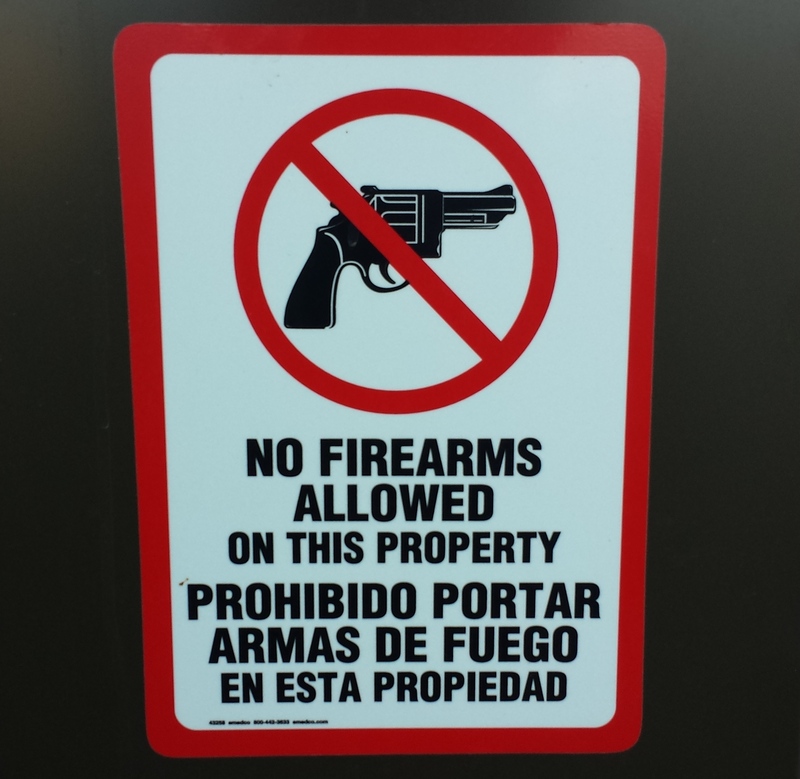 As a general rule, when we refer to gun free zones we are referring to places which allow for the general public to enter but prohibit patrons from carrying legal firearms into that place. Some gun free zones only prohibit open carry while the majority of gun free zones prohibit all firearms concealed or otherwise. Another important distinction to be made is the difference between government owned properties that are gun free zones and private properties that are gun free zones. Both need to be dealt with independently. Government gun free zones could include city, county, state, or federal buildings or properties where firearms are not allowed. Federal gun free zones such as post offices (all federal buildings) are naturally universally off limits in the USA while city, county and state gun free zones are going to exist specific to their own jurisdiction and thus vary significantly from one place to the next. The most topical, and arguably the most important of these are schools. Elementary, junior, middle, high schools as well as universities are generally owned and funded by the government and would be included as Government gun free zones in those states and jurisdictions where they are prohibited. Private property owners generally are empowered by law to be able to restrict firearms on their property if they so desire. This creates an environment in which gun owners are constantly on the look out for signs or written or verbal notice about a firearm restriction during the course of an average day. The majority of the places where adults spend our time is private property to include places like grocery stores, shopping malls, restaurants, movie theaters, banks, homes, businesses, and the gas station. In some states there are state level prohibitions against taking a firearm into churches and or establishments that sell alcohol but for the most part the decision to prohibit guns is left up to the property owner or the acting agent of the property owner. The Federal government has limited powers (or at least supposedly it does) and in theory cannot pass a law that requires that state, county, and city governments allow guns in their buildings and properties. It is simply outside the scope of the federal legislation. This means the changes would have to occur most at the state level… state by state. Property owners have rights. Among the best things about this country are the rights that come with property ownership. In order to pass a law that prevents property owners from restricting guns on their property one would have to trample on or undo all the existing rights of the property owner. Here are the proposals or ideas that I think have the best chance of happening. Pass a law that requires elementary, middle, junior, and high schools employ armed security. You would think it wouldn't take much to get something like this passed as representatives on both sides of the issue could likely come together to agree that this is a good idea. Perhaps more difficult at the Federal level but certainly at the state levels this should be easy to enact. The potential push back may come due to the potential costs that would be inflicted on school districts that are already strapped for cash. There are always ways to find money for a good proposal but I propose we take it from criminals by fining the endless number of criminals that attempt to buy guns despite being prohibited to do so. Its a few hundred thousand people each year of which less than 50 will actually be prosecuted and fined currently. Lets approach school security legislation from the good, better, best approach. Good is at least allowing each school district to decide if they want to put security officers in the school. Better is requiring schools put armed security at the school. Best is allowing that any adult with the legal ability to carry a concealed gun be able to do so in the school. Lets start at the top and work our way down the chain at each state legislature until we get one through. While we can't remove the rights of private property owners fully we could require that for the public's safety property owners provide armed security guards (based on the expected number of patrons at the property) OR they allow that the patrons themselves be armed. This may not sway your local restaurant (Starbucks) based on the average number of attendees but it is likely to have an impact on shopping malls and movie theaters that often have thousands of visitors to the property at any given time. Hiring armed security would be better than nothing but is more likely to act as a financial incentive to just allow private citizens to carry concealed. Giving businesses that prohibit firearms enough bad press can also go a long way to empowering change. While no amount of bad press is likely to stop the NFL from selling seats at football games, we may be able to sway American gun owners to switch the restaurants, hardware stores and movie theaters where they shop based on what companies have policies against guns. We are working as a company already and a more impactful strategy to use our mobile apps and our business directory to fully communicate what businesses don't allow guns. I would love to hear your thoughts below in the comments about realistic approaches to making big change happen specific to getting rid of Gun Free Zones! I agree that “gun free zones” are horrible and we need to get rid of them as fast, and as completely as possible. With that said, there should be a distinction made between places where guns are undesired by the property owner, and places where it is illegal to carry guns. In Utah for example, a property owner may post “no guns”, but this has very little legal teeth. It would be the exact same thing if I posted my property a “chapstick free zone”. It would not make bringing chapstick into my house illegal, it would make it against my wishes, and if I catch them I could ask them to leave, but I could not have them arrested for doing it. If they don’t leave when I ask, now they are trespassing. Same exact concept for guns in Utah, Nevada and many others. There are only a handful of places we cannot carry legally here, Federal buildings as you mention, and Mormon religious buildings. Even the “gun free zones” are fair game as long as you don’t get caught and asked to leave, after all you can’t see every sign, it’s not illegal, and my life is more important than the wishes of the property owner for me to be disarmed. This IS a key difference I think it is important to understand. I think Mr. Paulsen’s article is excellent. As a writer, I find it clear, totally non-confusing on just about any level, and to the point without the usual BS that goes with highly emotional subjects. The simple fact is, “Gun-Free” zones get innocent people killed! People [it was difficult for me to NOT say “Stupid People”] think a law will protect them, and proceed on that assumption . . . and die for that assumption. Why is it that people don’t understand that ANY law is ONLY obeyed by Law Abiding people? Criminals do NOT care about the Law . . . that’s why they are CRIMINALS! By taking guns away from Responsible, Qualified, Law-Abiding citizens, one is only aiding the Criminal. It is a Historical FACT that “Gun-Free Zones” have gotten hundreds of innocent people killed! I say, “STOP the useless slaughter of innocent people; give them at least a Fighting Chance . . . ELIMINATE “GUN-FREE” MURDER ZONES! Since all mass shootings I am aware of occurred in a gun free zone, seems like a good idea to get rid of gun free zones. Armed security is possible but the guard becomes a target. Excellent article and excellent proposal. In addition to addressing this locally (at the State level), the first gun free zone that needs to be eliminated is the Federal Gun Free Zone. This law creates paper violations thousands of times a day throughout the country by an individual not knowing walking within 1000 feet of a school –and can land anyone (including law enforcement personnel when they are off duty). This can only be accomplished by all of us writing our senators asking to draft a law to be introduced to the house/congress to repeal this law. Second, as a retired Federal Officer I would like to bring up a big misunderstanding about “Government Gun Free Zone” (see article, second section). For starters, this law has exemptions, let’s see how USC 18 § 930 begins. So it doesn’t matter what the can’t, don’t and shall not is written in the body of USC 18 § 930, if you are in subsection (d) then it does not apply to you. Your first premise is flawed on its face. MANDATING a specific one size fits all solution is foolish and ill advised. You come from the standpont of a professional, and your idea smacks of “inside make work” tactics. I believe the State of Ohio has adopted the best, most afffordable, most effective answer to school victim concentratioin zones: they passed a law giving the OPTION for schools, districts, and individual adults who are already at those schools, and deeply committed to the safety thereat, to take special training and then be able to carry their own concealed weapons. in the schools. Thousands of teachers and staff have taken the training and are in the schools… no one knows who, or where they wre… but thousands ARE there. So, any would be perp takes his chances on meeting Mr. Smith or Mrs Jones drawing down on him with their own handgun… and causing the perp to make an informed decision to not proceed. The cost to government? Almost nothing. Private funding has paid for most of the training, which is stellar. To mandate as you suggest instantly removes that sollution from the table, and mandates HIGH costs for paid professional security.. which carry the DISadvantage of being highly visible, instantly identifiable, and thus easy to “neutralise”. When a perp has no idea which of those twenty teachers might be carrying it is a serious game changer. Same principle for private property. I believe individual owners should have the right to dictate how things work on their propety… but that right ends when it puts the public who enter there at risk by virtue of being diarmed. Once more, your one size fits all “hire professional security” smacks of inside buddy make work. Not the best idea. As an alternative solution: any private proerty owner allowing the general public to enter thereon (grocery stores, depatment stores, restaurants, malls, etc) cannot restrict prively carried firearms or other defensive weapons without ALSO uncurring strict liability in the event someone does come into the place and cause harm to others…. who have been disallowed their right to protect themselves. THEN those peopret owners would have to face the reality that either they allow the public to tend to “the security of a free state” on their own authority, or the property owner so denying that ability now bears the burden.. however he desires to handle it. If he chooses to hire private security, or volunteer, or arms his employees, or simply does nothing and takes the chance no one will cause harm to the disarmed public and suffer the consequences at law, that’s HIS call. But to mandate a one size fits all that creates a new industry or greatly expands it is wrong. the added cost you mandate to business will be borne by the customers in that scenario. How about let’s simply return to the original intent of that pesky Second Article of Ammendment….. where the “security of a free state” is the responsibility of the whole people…. thus that same whole people MUST have their right to arms as the primary factor enabling and equipping them to do so. In other words, end infringement. Of any kind, at any level, for any reason. THAT was the original intent. Paid professional security (whether by government by tax money stolen at gunpoint) or private (property owner) funding is immaterial. Security is the task of THE PEOPLE. Return ot to us in every case.